Evelyn G. Ferrell, 96, of Huntington, IN, died Wednesday, Sept. 5, 2018, at 5:29 a.m. at The Hearth at Sycamore Village in Fort Wayne. For 20 years, Mrs. Ferrell and her husband lived in Luther, where they owned and operated Luther Grocery Store. 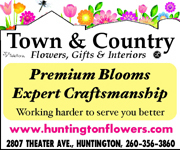 She later worked in the offices at Schacht Rubber Co. and Mann’s Inc. She was a member of Trinity United Methodist Church in Huntington and the Neta Chi Eta Bunco Club. She was born July 28, 1922, in Huntington to Wilbur G. and Fern Divilbliss Kinsey. 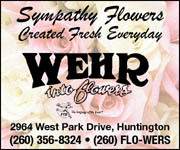 She married Earl L. Ferrell on June 28, 1938, in Van Wert, OH, and he preceded her in death on Aug. 30, 1996. Survivors include a daughter, Earlyne (Michael) Kline, of Fort Wayne; five grandchildren, Jayne Tomlinson, Joan Johnson, Michael Kline, Amy Nicodemus and Anne Hill; and seven great-grandchildren. She was preceded in death by a daughter, Ginger Tackitt; a son-in-law, Ben Tackitt; and a great-granddaughter, Ashley Tomlinson. Calling is Thursday, Sept. 6, 2018, from 3 p.m. to 7 p.m. at Bailey-Love Mortuary, 35 W. Park Drive, Huntington. A funeral service will be held Friday, Sept. 7, 2018, at 10:30 a.m. at the mortuary, with Rev. Kellie Herber officiating. There will be one hour of visitation prior to the service. Burial will be in South Whitley Cemetery in Whitley County. 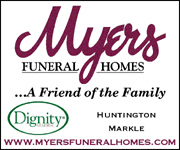 Memorials are to Visiting Nurse and Hospice or Huntington County Council on Aging (building fund), in care of Bailey-Love Mortuary, 35 W. Park Drive, Huntington, IN 46750.